THE Castle of Carrigadrohid is situated within three miles of Macroom, to the east, in the county of Cork, and province of Munster. It is built on a steep rock which rises in the middle of the river Lee, and its erection is attributed to one of the M'Carthy family; but this is disputed, and some affirm that it was built by the O'Learys, who held possession of it for a long time: others say it was built to please Lady O'Carroll, who was married to one of the M'Carthys, and who selected this beautiful and romantic spot for her residence. 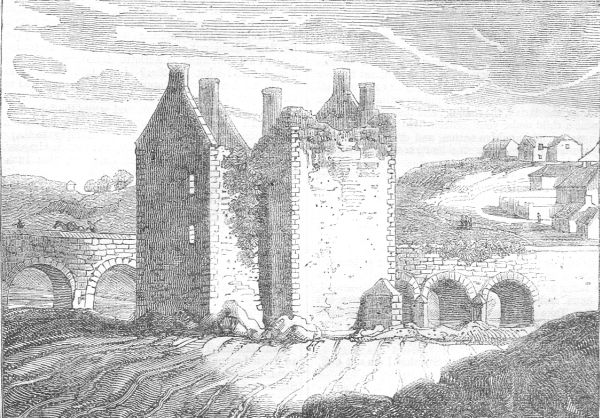 However, judging from the ruins, the castle seems to be of comparatively modern structure, by its square and gabled turrets; yet we cannot but admire the taste of the lady who pitched upon the wild rock of Carrigadrohid for the site of a castle. It commands the passage of the bridge over the Lee; and this castle and bridge were taken and retaken by the contending parties during the wars of 1641. It was then a noted pass. The Lee, or Ley, river extends from Macroom to Cork, a distance of twenty miles, and runs through a great part of the county of Cork, by Macroom, Crookstown, Carrigadrohid, and Cork. The Lee is supposed to be the Luvius of Ptolemy, and rises in that highly wild and romantic spot called the Lough Gougane Barra, which is deemed one of the greatest curiosities in the country. Gougane Barra, or the hermitage of St. Barra, or Finbar, is traditionally allowed to have been the hermitage of that Saint, before he founded the Cathedral of Cork.